Food Blogga: The 91st Weekend Herb Blogging Round-Up is Here! The 91st Weekend Herb Blogging Round-Up is Here! Here are 39 delectable recipes from around the world that make this 91st round of Weekend Herb Blogging shine! Allow me to extend a sincere thank you to everyone who submitted entries and a special thank you to Kalyn for dreaming up this fantastic food blogging event. If you find any omissions or errors in the round-up, then please email me, and I'll make the corrections as soon as possible. So, get ready to get hungry! Anna of Anna's Cool Finds kicks off this week's Weekend Herb Blogging with her lovely Ginger-Scented Orange Roughy and Sesame Ponzu Pouring Sauce. 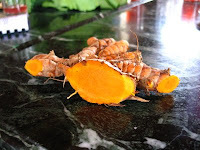 Anna informs us that in addition to being remarkably flavorful, ginger boasts many medicinal qualities. From relieving arthritis pain to reducing cholesterol, ginger is the miracle herb indeed! So, head over to Anna's to learn more about ginger and to get her delicious recipe. Ilva of Lucullian Delights features one of summer's most delicious vegetables: eggplant. Her Very Herby Roasted Eggplants , made with a medley of savory herbs, is a perfect example of Ilva's fresh and flavorful Italian cuisine. Which, reminds me... Ilva would like to know if you are interested in reading about Italian cuisine and cookbooks on her blog (YES, we are! ), so make sure you drop by her place and let her know what you think. Myriam of Once Upon a Tart shares a simply splendid sauce with us: Cinnamon-Plum Compote with Raspberries. This compote made from zwetschge (German for damson plums) is not only simple to make (under 10 minutes) but also versatile. Myriam suggests serving it with cake, ice cream, yogurt, or rice pudding. Once you see her beautiful photos, you'll be running out the door for some zwetschge. And should you stub your toe in your hurry, you can yell, "zwetschge," since it's also Myriam's favorite swear word. Honest. Would I make that up? 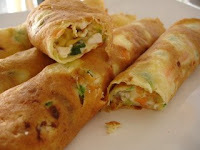 Patricia of Technicolor Kitchen offers us her savory Vegetable Crepes with Cottage Filling. Made with non-fat milk and cottage cheese, Patricia proves that food can be both delicious and low-calorie. So, go ahead and indulge on these crepes and still look fabulous in your bathing suit. If you weren't already convinced about making this tasty recipe, Patricia admits that the crepes were so good, she even ate some cold leftover ones later in the day. So, what are you waiting for? Scoot over to Patricia's for this low-in-fat but high-in-flavor recipe! Alanna of A Veggie Venture offers her kickin' Cowboy Coleslaw. Don't worry if you don't own any cowboy boots; you can still make this kid (and adult) friendly colewslaw with carrots, red cabbage, green onions, and sunflower seeds. If you're watching your weight, then Alanna suggests omitting the sunflower seeds. 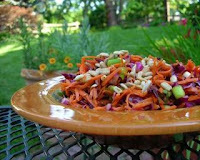 I think nutty, crunchy sunflower seeds in this slaw would warrant an extra 10 minutes on the elliptical; don't you? Now, get a move on' to Alanna's for more helpful nutritional information about this festive and flavorful coleslaw! 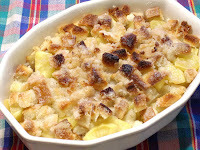 Glenna of A Fridge Full of Food tempts us with her Apple Brown Betty, a comforting dessert that is a cross between apple crisp and bread pudding. Who wouldn't love that? Plus, Glenna assures us that it's simple to make and just light enough for a summertime treat. Make sure you visit Glenna and read her engaging post about how pop culture influences our choices in food (think Carmela's ricotta pie from The Soprano's); you'll leave both entertained and hungry! Tigerfish of Teczcape offers us her Steamed Herbal Chicken made with a Chinese herbal pack, honey dates, and wolfberries. Tigerfish edifies us with an explanation of six different Chinese herbs including a type of lotus, a lily bulb, and, my personal favorite, Dioscorea Opposita (pronounced huai-shan in Mandarin), a type of yam that has ANTI-AGING properties! Yup, that's right. So, make Tigerfish's herbal chicken for its savory authentic Chinese flavors and look younger too. What more could you ask for? Elizabeth of Blog from OUR Kitchen offers a mouth-watering Focaccia with Rosemary and Onions. I'm warning you: don't go to her site if you're starving. If you choose to ignore my warning, then expect to run to the market for yeast, rosemary, and onions, because you'll be making Elizabeth's focaccia for dinner. She kindly offers us detailed yet easy-to-follow instructions for both thinner and thicker focaccias. I personally think the thicker the better, but head over to Elizabeth's to decide for yourself. Kevin of Closet Cooking presents elegant Grilled Lamb Chops in a Red Currant and Rosemary Sauce, which was inspired by Kalyn's Grilled Lamb Chops with Garlic, Rosemary, and Thyme (yes, the very same Kalyn who started WHB). 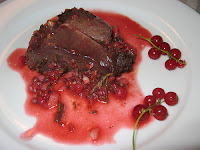 Since so many currant recipes are for desserts, it's a pleasure to have Kevin's savory recipe. So, check out your local market for fresh currants, which are currently in season, and try Kevin's recipe next time you want a special meal. Simona of briciole presents an authentic Italian Panzanella. Like Simona says, panzanella is "fundamentally a way of dressing up stale bread, but I like my father's recipe the best." And you will too. Simona reminisces about her childhood summers spent in Poggio Catino, her father's native village in Sabina, north of Rome. 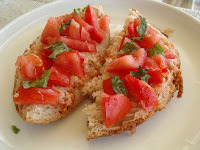 It's an evocative post that will make you yearn for some of Simona's tomato-soaked panzanella (that's her secret) and for some leisure time in Poggio Catino. Kalyn of Kalyn's Kitchen, and creator of Weekend Herb Blogging, offers us her nutritious and delicious Sauteed Radishes with Vinegar and Herbs. Although Kalyn has the dubious honor of being the aunt who might bring "wierd" food to family-get-togethers, she risks her reputation with this fragrant, herby, sauteed radish dish. Who could blame her? Ever since making Roasted Radishes with Soy Sauce and Toasted Sesame Seeds, Kalyn has been hooked on the taste of cooked radishes, and so will you when you try her recipes. 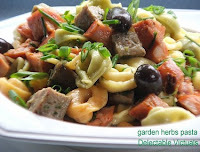 Sheela of Quick and Easy Recipes: Delectable Victuals presents a lovely summertime Tortellini with Fresh Herbs, made with home-grown herbs. If you're like me, you'll long to take a walk through Sheela's redolent herb garden after you read her post. Though Sheela's vegetarian version calls for mock chicken sausage and tofurkey kielbasa, she also recommends substituting red meat, if you prefer. With heaps of fresh herbs, olives, sun-dried tomatoes, and tortellini, this is one pasta dish that surely won't have any leftovers for lunch the next day! 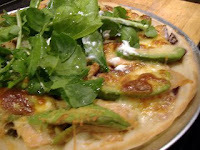 Pam of The Backyard Pizzeria presents a sophisticated Smoked Salmon, Capers, Red Onion, and Avocado Pizza Topped with Fresh Rocket and Sour Cream. Pam was inspired to make this creation after a recent trip to Perth in Western Australia. While there, she was lucky enough to stay in an apartment within walking distance to The Pizza Palace, which offered "20 mouth-watering pizzas." After reading Pam's delicious post, you might need to go to Expedia to check on flights to Western Australia. 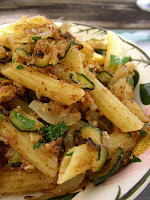 Zorra of Kochtopf shares her delicious recipe for Penne with Courgette and Bread Crumbs. This is one of those pasta dishes that is beautiful in its simplicity and remarkably fresh flavor. Zorra's addition of toasted breadcrumbs and grated Parmesan (which makes this a winner) enhance the zucchini and onions in the dish. And if you're feeling up for a little challenge, then visit Zorra's site to see if you'll be able to identify her mystery herb. Pille of Nami-Nami generously shares two scrumptious recipes featuring zucchini blossoms: Zucchini Blossom Fritters and Zucchini Blossom Frittata. Pille clearly has a green thumb: she has already picked her freshly grown strawberries and is awaiting tomatoes and baby beetroots. It's her zucchini, however, that is thriving, providing her with a bounty of delicate, delicious zucchini blossoms. 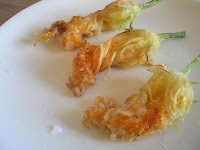 (I must admit I have a weakness for zucchini blossoms and get giddy at the thought of having a garden full of them!) So, check out Pille's zucchini blossoms. You'll be glad you did! Charise of more bread and cheese, please! offers a flavorful Horseradish Potato Salad just in time for summer picnics and bbq's. This recipe, made with light mayo, horseradish, chives, and a touch of sugar is a welcome twist on traditional potato salad. Also, did you know that horseradish isn't hot until it is grated or ground? Don't believe me? Then head over to Charise's to learn more about horseradish (and about her wild canoeing adventures). Burcu of Almost Turkish Recipes presents a beautiful Baked Ratatouille inspired by Remy of the new Disney-Pixar film Ratatouille. With summer vegetables such as zucchini and tomatoes and a medley of herbs including basil, oregano, parsley, and dill, Burcu has created a delightful summertime dish that is sure to please. And be sure to check out Burcu's post for more stunning photos. Katie of Thyme for Cooking shares an innovative recipe for Lettuce Soup. 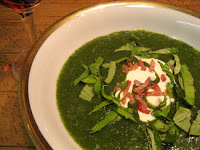 With a bounty of red and green romaine lettuce from her garden, Katie was inspired to make this soup, which also includes shallots, tarragon, sour cream, and bacon. One of the reasons she has so much fresh lettuce is because she never wants to find herself stuck in an area where the markets offer only wilted, over-ripe produce. And who could disagree with that? Plus, be sure to read Katie's post to learn about the many nutritional benefits of lettuce. Peter of Kalofagas--In Pursuit of Delicious Foods presents a unique version of Zucchini Carpaccio with Mulberries. 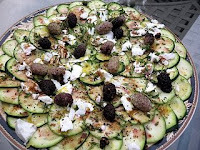 Thankfully for us, Peter overcame his concern about presenting another zucchini carpaccio recipe, and offers a unique version with fresh mulberries, crumbled Manouri cheese, lemon juice, and fresh thyme. Peter is especially fortunate in that he has his own mulberry tree from which to pluck fresh berries for this recipe (that is, if the birds don't get to them first). After seeing this recipe, you may want to ask Peter for his address. Sarah of What Smells So Good? serves up a slice of her savory Sun-Dried Tomato and Olive Bread, made with fresh basil and asiago cheese. Could there be a better combination for bread? Seriously. Though you may be well aware of basil's culinary uses, read Sarah's informative post to learn about its medicinal qualities as well as storage tips to keep your basil fresh and fragrant. Sarina of Trinigourmet offers her Afghani Fried Brown Rice, an aromatic and savory alternative to plain fried rice. Sarina's fried rice is made with Ras-Al-Hanout (a fragrant medley of Moroccan seasonings) and fresh bay leaves plucked from a tree in her own yard. In addition to being a staple herb in many countries, bay leaf has a rich history: For instance, did you know that Roman laurels were made from bay leaves? For more interesting tidbits about this herb, read Sarina's engaging post. Oh, and don't forget to remove the bay leaf before eating the rice; though it won't kill you, as Sarina's straight-shooting West Indian mom says, "yuh stupid enough to eat it? 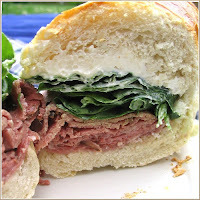 :)"
Amy of Nook and Pantry generously offers two sandwiches that are guaranteed to elevate your ordinary picnic fare to extraordinary: A French Ham and Butter Sandwich and a Salami, Pastrami, and Spinach Cream Cheese Sandwich. If you make the ham and butter sandwich, then heed Amy's warning: "don't you dare use 'I can't believe it's not butter' because I can believe it, and it's not butter. ;)" As for the second sandwich, Amy prefers Philadelphia cream cheese, for its velvety smoothness. If you aren't already running into your kitchen to whip up these sandwiches, then run over to Amy's to view more of her appetizing photos. You'll want to take a big bite as soon as you see them! Anna of Morsels and Musings shares a splendid post about the avocado, which is the featured ingredient in her Soupe d'Avocat Abidjanaise (Abidjan Avocado Soup). 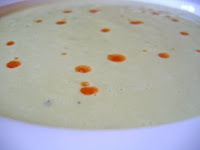 This soup is a popular recipe from Côte d'Ivoire and marks the 39th country from which Anna has cooked and posted recipes. Kudos, Anna! In addition to a fascinating description of Côte d'Ivoire culture, Anna offers an engaging write-up about avocados that will certainly surprise you. For instance, remarkably, the Aztecs believed that avocados were an aphrodisiac and during harvest season kept virgins indoors to prevent promiscuous behavior! Intrigued? Then visit Anna for more interesting musings. Sarah of Avenue Food will convince you to give tofu a try with her Mom's Tofu Salad. Sarah, who loves, loves, loves her tofu, laments, "I just don't understand why some people dislike the stuff so much, they can't help but roll their eyes at the very mention of the word." (As a tofu lover myself, I know what she means). But, if you make Sarah's tofu salad, which includes tuna, watercress, and a sesame oil-soy sauce dressing, you too may become a tofu devotee. 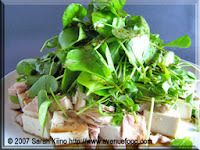 Whether or not you love tofu, be sure to read Sarah's engaging post, which I promise you will love. Chris from Melecotte presents her aromatic Sun-Dried Tomato Thyme Muffins, featuring her garden-grown thyme. A self-ascribed "green thumb in training," Chris has been spending a lot of time in Home Depot Landscape and in her garden, and we get to reap the benefits with this savory recipe. Be sure to read Chris's post about thyme: she provides indispensible planting, culinary, and storage tips. And if you're feeling timid about something, make Chris's muffins in a hurry because thyme is known to boost strength and courage. Even the Lion on his way to Oz nibbled some, so you know it works! Ulrike from Kuchenlatein offers an elegant Lavender Sugar that is a breeze to make. Though lavender is usually associated with perfumes, sachets, and cosmetics, Ulrike reminds us that is has culinary purposes as well. 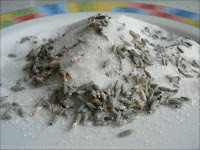 Wondering what to do with your fragrant lavender sugar? Ulrike says, "you can pass the sugar through a strainer to remove the buds or leave them in when you use it to sweeten tea, to make lavender ice cream or lavender crème brulée." 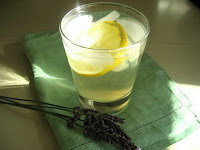 Oh, and make sure you check out Ulrike's post for a second recipe for refreshing lavender lemonade. Haalo from Cook (Almost) Anything at Least Once is excited to share her Sauteed Mushrooms with Fresh Wasabi. I will admit that I got excited by Haalo's post too. 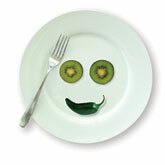 Did you know that fresh wasabi is an aquatic plant and should be stored in a glass of water in your fridge? Be sure to visit Haalo to learn more about this intriguing ingredient and to view her stunning photos. This is one truly eye-catching entry! Sue from Coffee and Cornbread stays cool with her refreshing Lemon Mint Iced Tea. As a Virginian, Sue loves her iced tea and makes many varieties. This time around, she has chosen to use peppermint, though she says most any type of mint will work. Sue has made many a thirsty houseguest happy with a glass of her tea, and you will be too when you whip up a batch. So check out Sue's blog for the recipe. 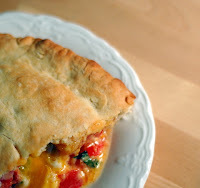 Emily of Superspark will definitely make you salivate for a piece of her savory Tomato Pie. Trying to re-create a pie that she relished years ago in college, Emily writes, "Think layers of sweet, ripe tomato slices with fresh basil, gooey cheese, and a warm biscuity crust and you’ll start to understand the simple, rustic allure of tomato pie." Are you hungry yet? (I am.) Then, check out Emily's post for more appetizing photos and tips on how to make this comforting, rustic pie. 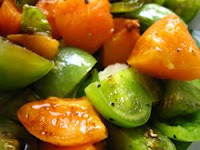 Genie from The Inadvertent Gardener offers an innovative recipe: Warm Green Tomato and Apricot Salad. What do you do when you discover that your unripe tomato plant is drooping beyond salvation and you have an "an inadvertent harvest" of green tomatoes? You use your creativity, like Genie did. Inspired by Kalyn's Caprese Salad with Apricots, Genie decided to make a warm salad of green tomatoes, apricots, mozzarella, and basil. The result? A beautifully colorful and zesty lunch that "fired up her tastebuds" and will fire up yours too! Another Outspoken Female from Confessions of a Food Nazi presents an exotic entry: A Balinese Inspired Fish Curry with Curry Paste. Curmuca longa, or fresh turmeric, is the star among stars in this wonderfully aromatic and flavorful dish. Inspired by a recent class in Balinese cooking, this Outspoken Female blends ingredients such as kaffir lime leaves, tamarind, lemongrass, and galangal to create an authentic curry. After reading this post, you may have to take a trip to Melbourne for some fresh turmeric, but that wouldn't be so bad, would it? Sher from What Did You Eat? 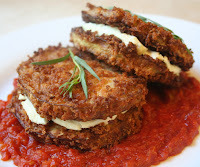 would convert even the most staunch carnivore into a vegetable lover with her Eggplant and Goat Cheese Sandwiches with Tomato Tarragon Sauce. I mean come on, take another look at them--aren't they just mouth-watering? And if you're trying to get your kids, or anyone else for that matter, to eat their veggies, then tell them you've made Whoopie Pies for dinner. That's what Sher likes to call them, and you will too! So, go ahead, and make some Whoopie. Pies, that is. 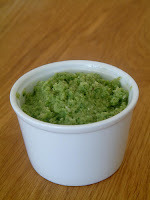 Wendy from A Wee Bit of Cooking presents her fiery Thai Green Curry Paste used in her Thai Green Chicken Curry. Wendy warns that if you are a "chilli wimp" like she is, "the following paste is seriously potent stuff. My head almost exploded when I foolishly dipped my finger into my homemade green curry paste and tasted it. Wow! It was hot!" Well, Wendy, you don't scare me. (OK, well not that much.) I'm more than ready to try Wendy's delicious curry paste, which includes lemongrass, coriander, and lime juice. By the way, if you've got a soft spot for dogs, really adorable dogs, then run over to Wendy's to check out pics of some of her canine friends. John from Top Chef John Mundell offers us his savory Marinated Portobello Mushrooms. After marinating the mushrooms overnight in a mixture of garlic, lemon juice, lemon zest, basil, vegetable oil, and plenty of cracked black pepper, John slowly cooks them to buttery soft perfection. Though he uses them in any number of dishes, John really likes to stuff them with goat cheese and sun-dried tomato, then fold them in spring roll paper and fry until golden. Sound tempting? Want to see what it looks like? 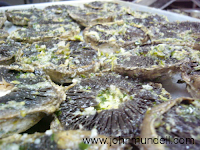 Then visit John's site, and while you're there, learn more about cooking with delicious and nutritious portobellos. Y from blog.lemonpi.net (in Australia) is making me yearn for winter with a fabulous Roast Pumpkin and Chickpea Salad with Tahini Sauce. With ingredients such as cinnamon, allspice, and Dukkah, Y's dish is upscale comfort food at its best. Just think...now, thanks to Y, we have a delicious way to use up our old jack o'lanterns after Halloween. Plus, with its high levels of vitamins and minerals, this nutritious pumpkin recipe might help counter some of the ill effects of too many candy bars. Yearning for more? Then, check out Y's post. You'll be glad you did. Ceviz from Only Turkish Food offers a traditional Turkish recipe: Bulgur Pilav. Ceviz tells us, "Bulgur is a traditional ingredient for making pilav or pilaf in Turkey (burghul in Arabic). 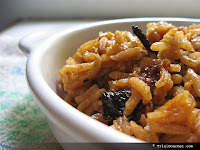 Turkish often accompany main meals with pilav either of rice or bulgur." Fortunately, you don't have to be Turkish to enjoy Ceviz's wholesome, satisfying pilav. As she says, "it goes well with food from other kitchens." She's right about that. If you're like me and love bulgur, then you simply must visit Ceviz's site to read her cooking tips for making the perfect pilav, including how to prevent it from sticking to the bottom of your pan. Her newfound secret--a rice cooker. 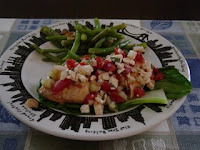 Sharon of Bird Food presents a lovely and light Tomato, Basil, and Feta Cheese Bruschetta over Salmon. It will come as no surprise that Sharon, who is Italian, LOVES her basil. (I know what you mean, Sharon!) And who wouldn't love this dish? Made with Genovese basil and Roma tomatoes, this is a little taste of Italy right in your own home. Plus, it's easy to prepare, which leaves you with plenty of time to enjoy the lazy days of summer. Karen from Family Style Food (a native Rhode Islander like me), is enjoying her herb garden while sipping on her fragrant Lavender Lemonade. Inspired by the redolence of her lavender plants, she was deciding if she should make something like panna cotta or shortbread cookies, but since today is hot in St. Louis, Karen (smart cookie that she is) decided to go with lavender lemonade. So, stay cool by checking out Karen's post for the details. 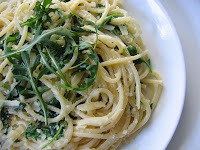 For our final entry this week, I, Food Blogga, humbly present my Wild Rocket (Wild Arugula) Pasta. Inspired by the fabulous Jamie Oliver, I promise you that this recipe will elicit praise from your guests. And the best part is, it only takes minutes to make. But, don't tell that to your guests. Once they've tasted it, they'll think you've slaved all day! Thanks for the fabulous round-up! Such creative and delicious dishes everyone has dreamed up! Fabulous job Susan! This is a great round up! Lots to check out...I so wish I had 5 tummies to fit all the funny food. Thanks for all your hard work! What a great job you've done. (The guest hosts are always putting me to shame.) It amazes me at how people keep coming up with wonderful stuff week after week. Isn't it great! I've seen some of these but tomorrow morning I'll get a big cup of coffee and head off to read all the ones that I've missed. Thanks so much for all your work. Look at all these great dishes! You did a fabulous job with the round up. Thanks so much for hosting! Hi Susan, great job. You had your work cut out with all of these fantastic entries. Now I have too find time to read them, looking forward! What a nice roundup Susan, you put a lot of work into it! Thank you! So many entries again - thank you for a lovely roundup, Susan!! What a great round-up Susan! Well done, and all that! Another thunderstorm and France Telecom bites the dust! Great job Susan! Looking forward to trying some of these out. Fabulous roundup! Thanks for putting it all together so well. Susan, I'm glad to be a part of such a fabulous round up! The dishes look so delicious! What a beautifully presented roundup! I'm very much looking forward to perusing each of the entries. And many thanks for your very kind words about our focaccia! Great round up! I wish I had been able to join...my goodness, everything looks amazing! Susan, you are a most gracious hostess. You've presented a wonderful round up of amazing dishes! Thank you. This is a fantastic roundup susan. I think I'll join the next round of herb-blogging! There are so many great recipes here where do I start? Many, many thanks to each of you for your kind words. I came here via Scribbit (thanks for judging the contest). I am so dumbfounded by all these tasty-looking recipes, I don't know where to begin. Yum! Great round up! So many tempting recipes! Some really cool entries here! Hi Susan! What a wonderful roundup you put together! I have found index of guidebooks similar to your blog content and would like to share. There are interesting ideas for cooking, recipes, home care, etc. Get it and enjoy! Susan, thanks for rounding up! Everything looks so tempting.